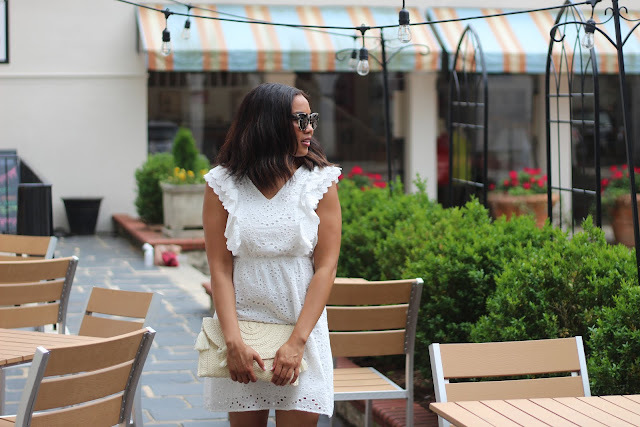 Ruffled White Top: Marshalls. Denim via Warp+Weft found here. Shoes via Nordstrom Rack linked below. Bag via Amazon found here. Finding great quality denim at a reasonable price is such a struggle. I don't know about you but denim is such a staple piece to have and be able to throw on; and to dress up or down. I always buy cheaper brands, and then end up disappointed when they stretch after the first wear- not cute! Warp + Weft Denim was kind enough to send me two pairs to try out, and you guys I'M OBSESSED. I'm 100% sold on this brand and want to share with you guys why I love them so much! 1.) Warp + Weft denim is a brand conscious of size inclusivity, and makes denim for all body types. There is a piece for everyone which in and of itself is such a comforting feeling as a consumer. 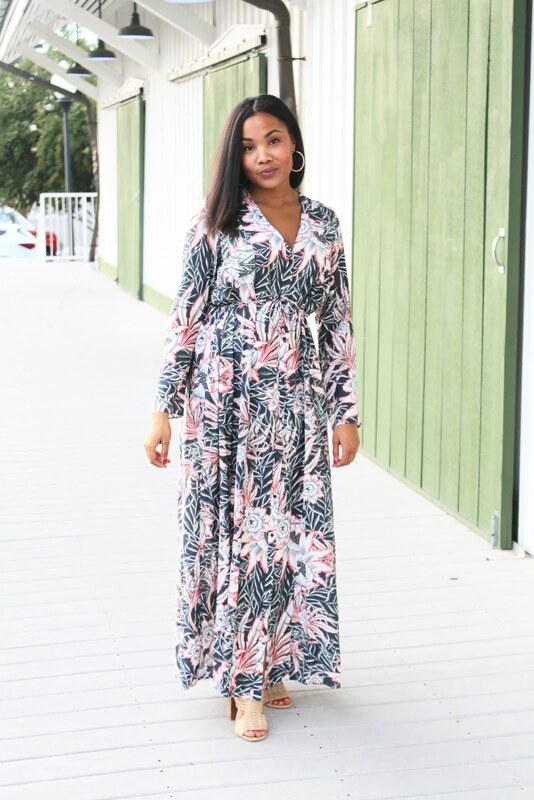 It feels good to know that you can shop and find something just for you and that you were considered throughout the whole design process. 2.) All of their denim is under $100! 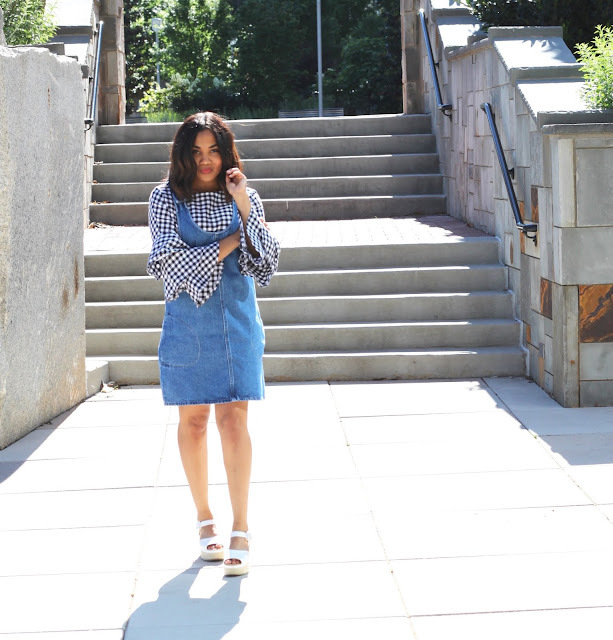 Denim is something I'm willing to splurge on, and under $100 isn't bad at all! Especially for amazing quality. 3.) The fit and stretch makes you look and feel like a rockstar. I love that the specific pair I'm wearing here (The Palm Springs Crop Boot Cut; fun fact: all of the jeans are named after an international airport-so cool, right?!) 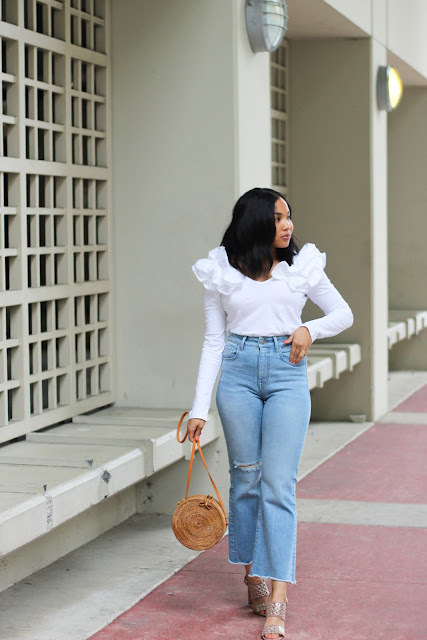 are high-waisted and distressed which are two of my favorite details in jeans. All in all I'm impressed with this brand, and the way these jeans make me feel- so confident, chic and carefree! Believe me when I say you need them in your life. 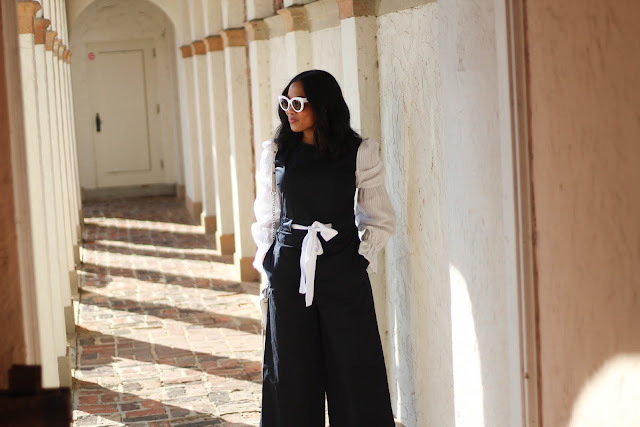 Culotte Jumpsuit-Belk found here. Shoes: Target found here. Sunglasses: Quay Australia. Happy belated First day of Spring! The East Coast feels like we rewound and went back to December- it's freezing out. I have slowly but surely been transitioning my closet to include more touches of Spring but the weather isn't making it easy. 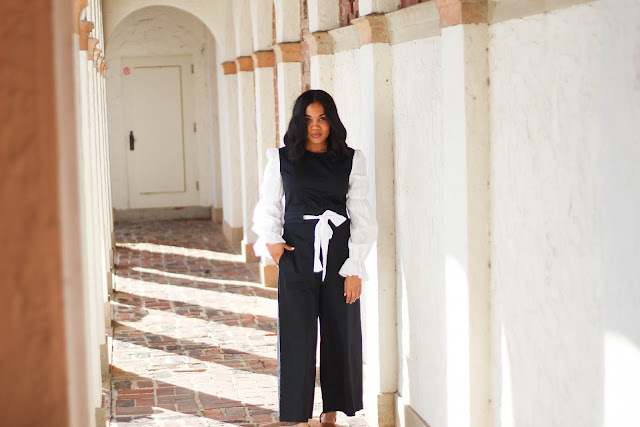 I love a good jumpsuit, and this culotte one took the cake the moment that I laid eyes on it. 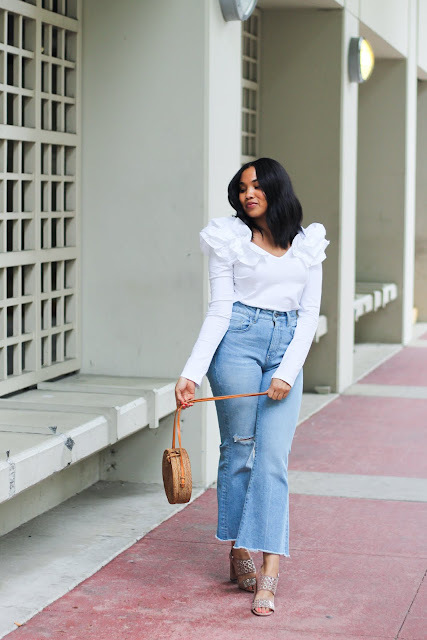 I'm obsessed with the ruffle sleeves, and the chicness of the crisp white and navy combo. 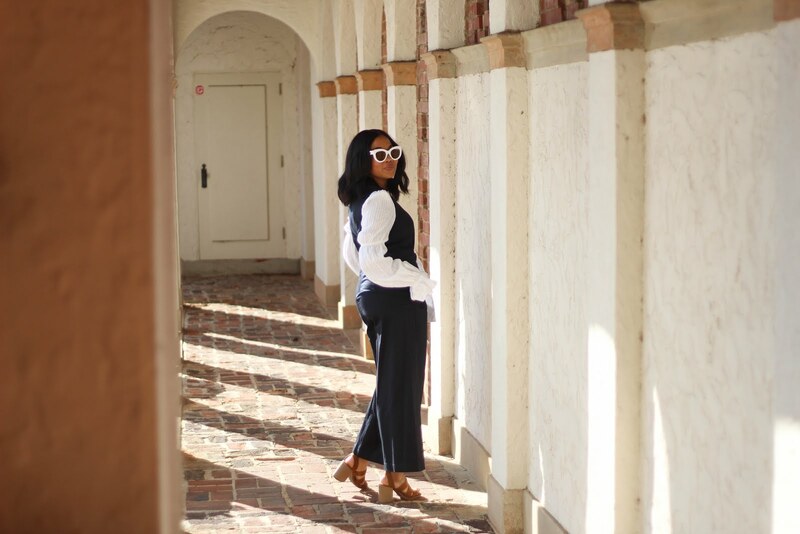 It's such an easy outfit to take from the boardroom to happy hour. I work in a corporate setting Monday-Friday and have the option of being pretty casual yet fashion forward day to day however I always want to be sure that I am putting my best foot forward and dressing the part. I love that navy is a professional shade without being too bland and boring. I'm so happy I snagged this piece- and, on sale too! I've linked some similar options below. Happy Shopping! 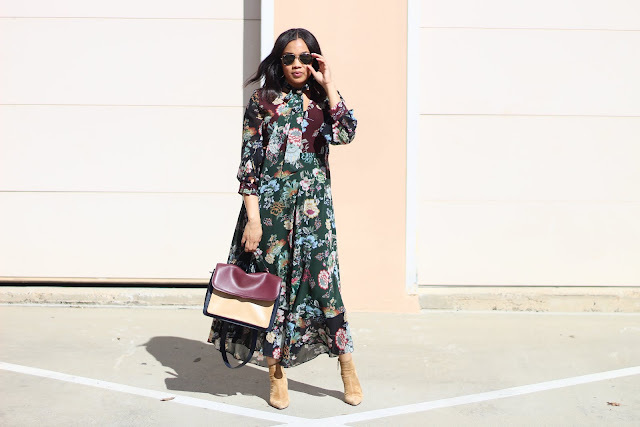 Floral Dress: Zara- SOLD OUT but similar dress found here. Booties: Alice and Olivia via Marti and Liz Shoes. 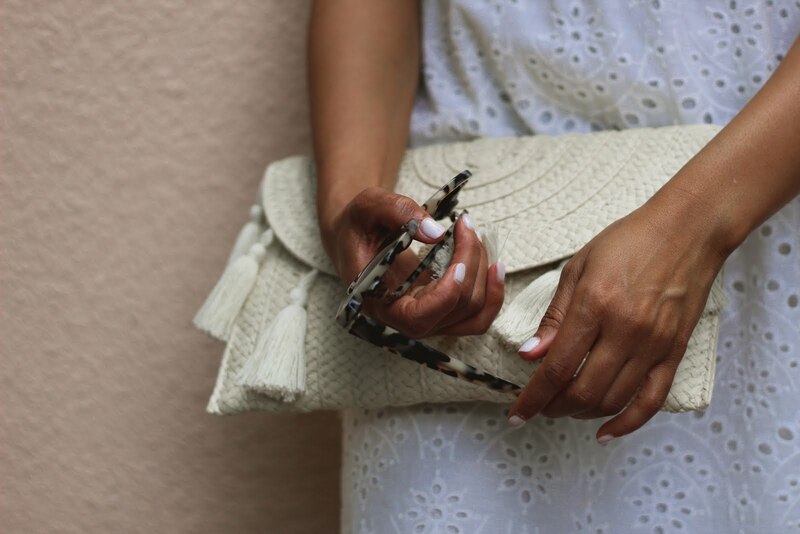 Bag: Rebecca Minkoff via Nordstrom Rack. Suede Moto Jacket: Jou Jou via Marshalls. Sunglasses: Rayban via Belk found here. 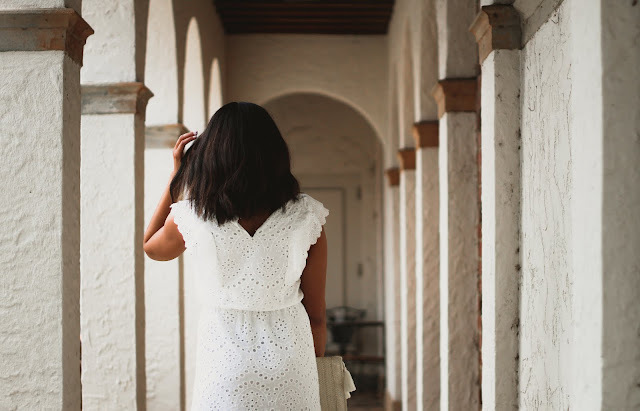 With Spring right around the corner, I have been brainstorming and daydreaming of beautiful Spring/Summer pieces to begin to add to my wardrobe. 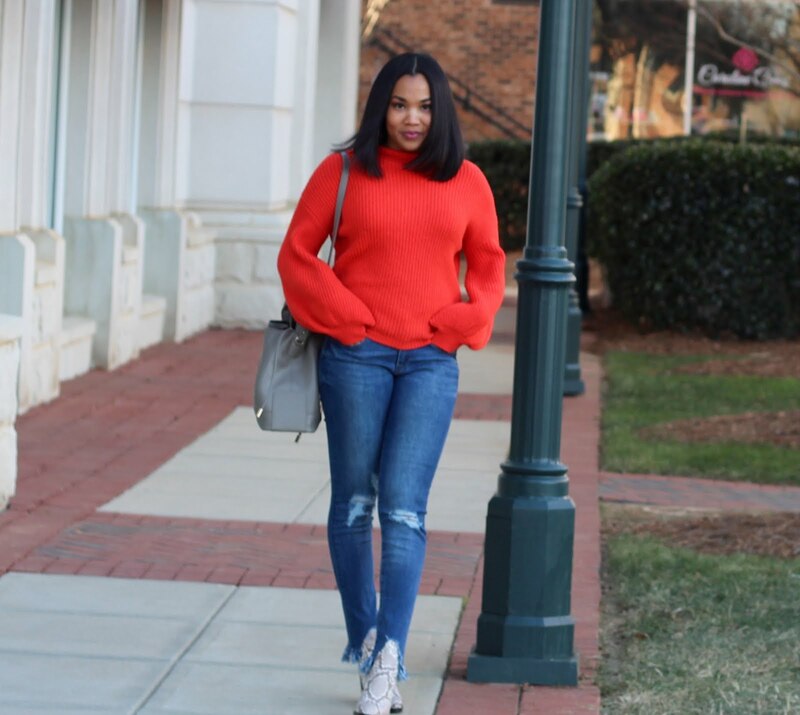 We are in that weird time of the year here in North Carolina where the days are unusually warm, which leaves you standing in front of your closet with absolutely nothing to wear. Transitioning into Spring can seem daunting and hopeless but I'm here to tell you that it doesn't have to be that way if you simply remember 2 things! Layers and patterns/color! 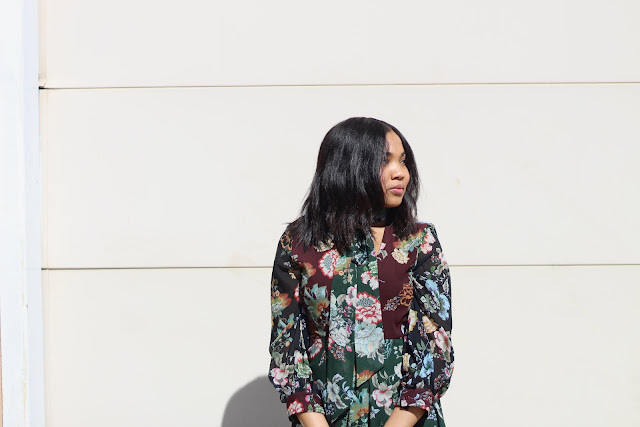 Fun layers and Spring patterns/colors can be your bridge to full-out Spring wardrobe. Layers give you endless options. I love throwing a motto jacket over my shoulders with the option to take it off if I get too warm. 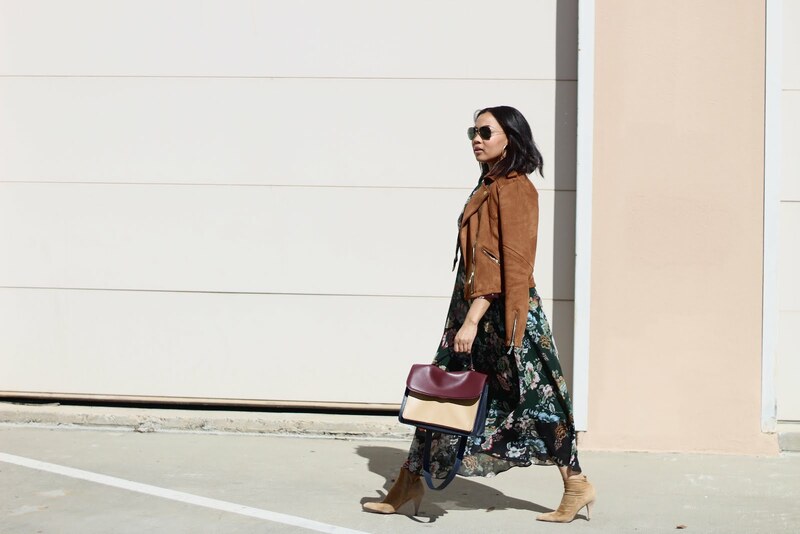 A motto jacket is chic in every way and is sure to polish any look you have in your closet. I love playing with patterns and colors! Don't be afraid to embrace florals, because they are here to stay. 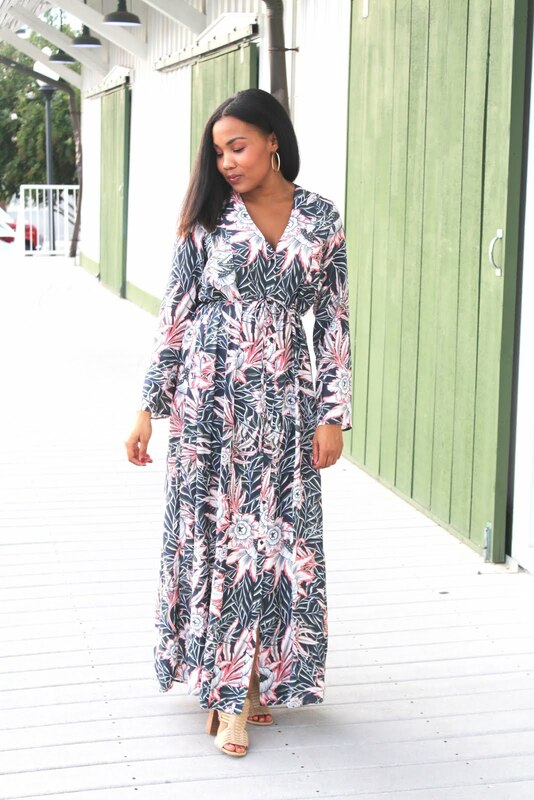 If you are drawn to more darker shades, then this dress is perfect! I knew I had to have it as soon as I laid eyes on it. 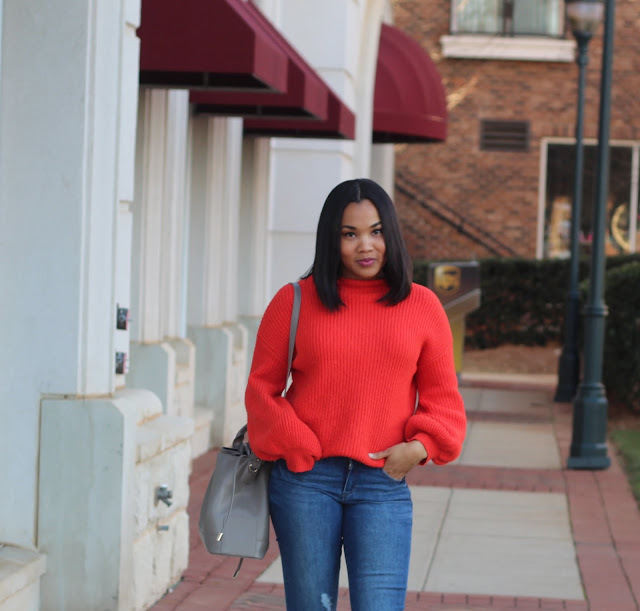 I've definitely been getting my fair wear out of these Alice and Olivia camel sock booties that I scored for a steal from Marti and Liz Shoes here in Charlotte. These shoes are killer!!! I would wear them everyday if I could. 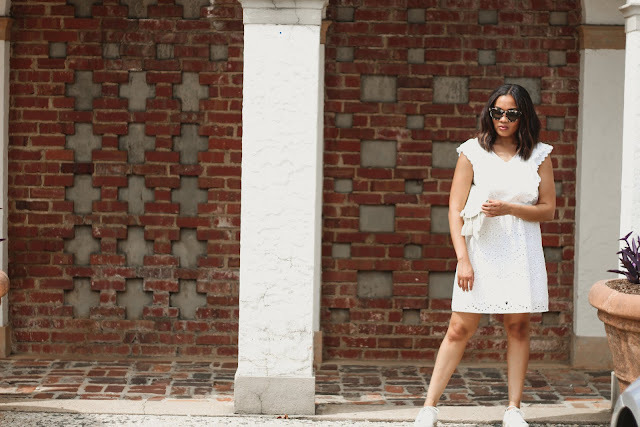 Do you find it difficult to transition into Spring? What pieces are your go-to to make the transition? Blush Coat: Zara found here. 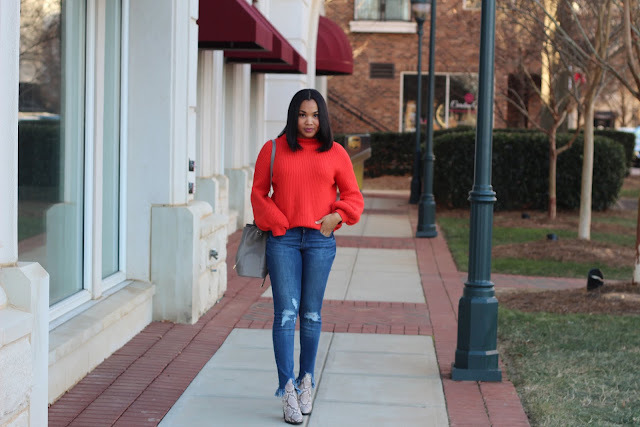 Blush Knotted Sweater: ASOS found here. 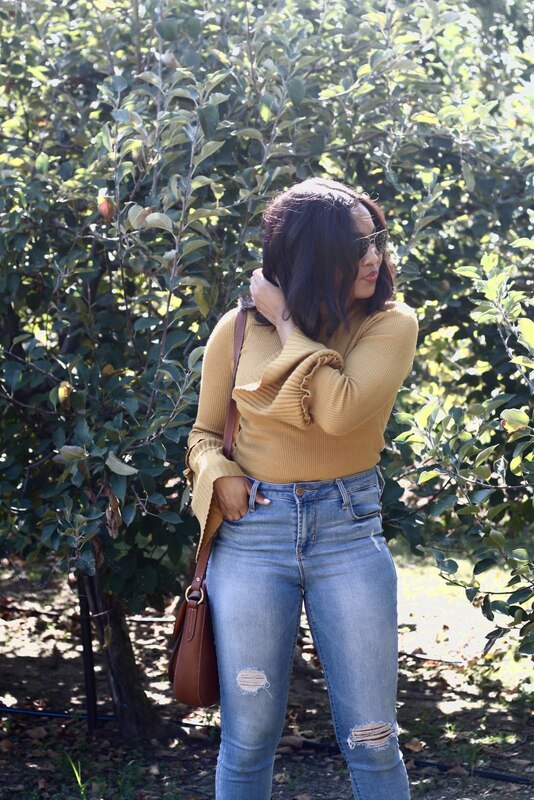 Tractr Jeans: Nordstrom Rack found here. Camel Sock Booties: Alice & Olivia via Marti & Liz Shoes found here. After the holidays is the perfect time of year to purchase a great piece of outerwear. I had a lot of time off work post holiday, and spent a good amount of that time scouring the internet for the best sales. There is no surprise that ZARA had some of the best pieces for amazing prices! I scored this amazing creme coat with blush detail and I'm so glad that I snagged it. 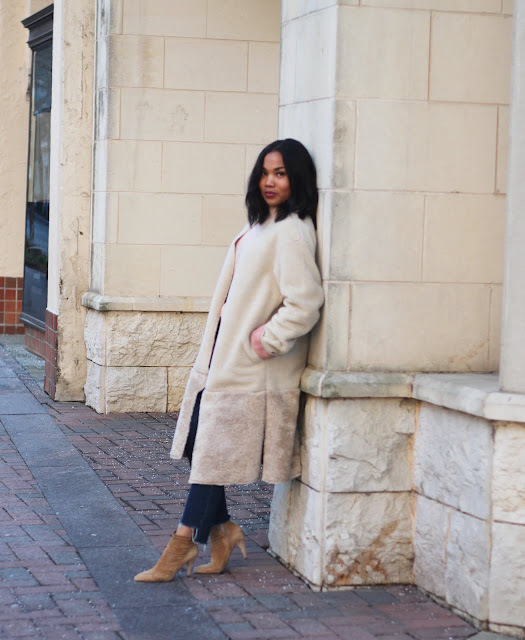 If you are like me, and follow a ton of bloggers then you know that the Teddy Coat has been a huge trend this winter season. This piece reminds me of the Teddy Coat in a less plush way. The shearling and fur detail at the bottom are such a chic combination. 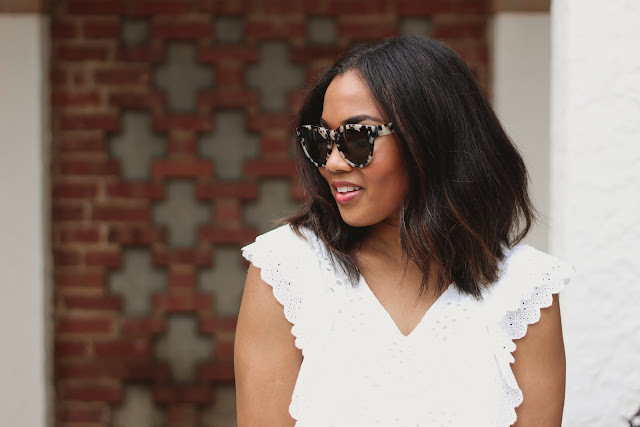 I love that this piece isn't like anything that all the other bloggers are wearing! 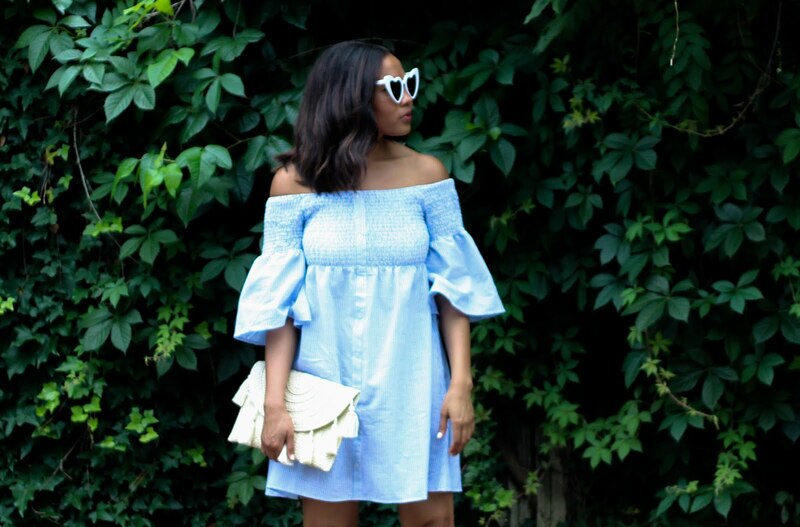 Don't be afraid to try trends in different interpretations! I love that about fashion. You have the ability to make any trend your own. There are always 3 things that I keep in mind when purchasing a nice piece of outwear. Color, versatility, and comfort! Color: There are so many fun coats this season!! 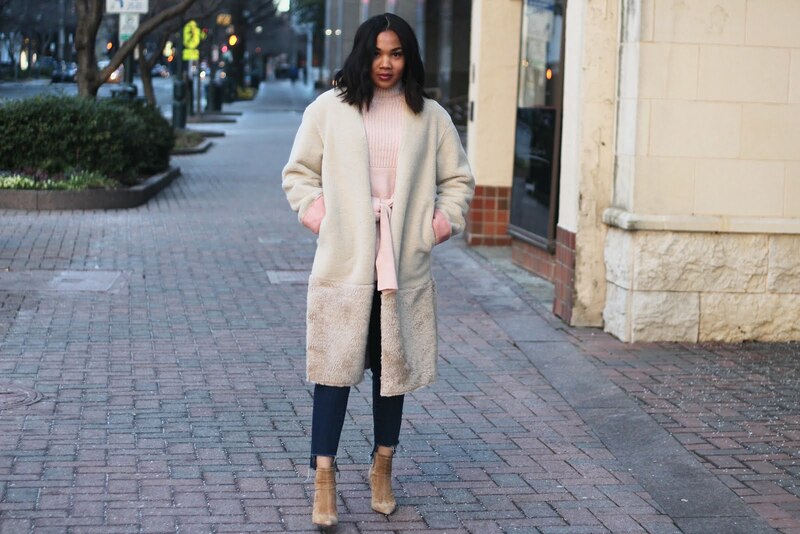 From faux fur, to bright, fun colors, and neutrals. 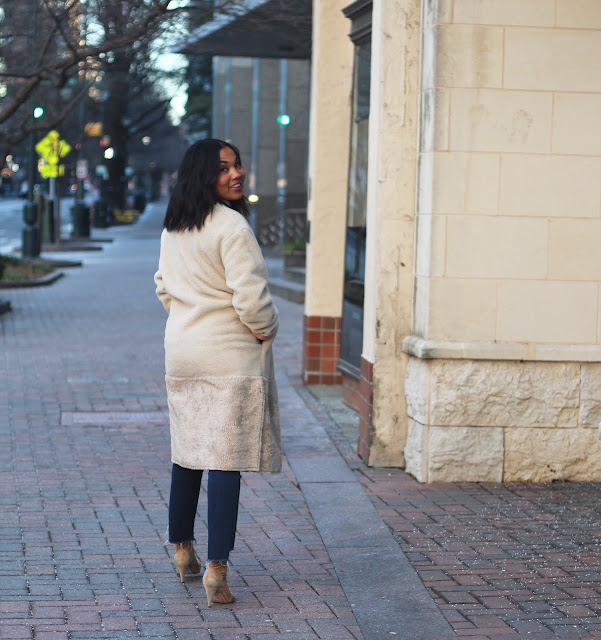 I, myself am drawn to the neutral palette (blushes,camels, cremes, grays) as these colors are easily transitional between seasons and over the years. Finding a neutral piece of quality outwear can last you a good 5 years. Versatility: There are so many variations and styles of coats. They can range from dressy to really casual. Your outerwear selections all depend on your everyday style. For me, I spend most of my days in the office and in dressy/casual pieces for work so I like to have something that will match that same vibe but could also be dressed down! 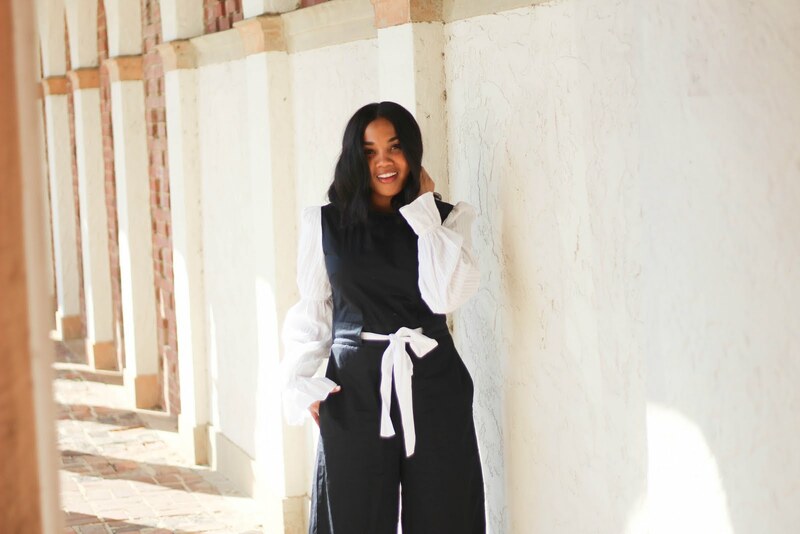 Versatility in outwear is super important! Make sure your selection is aligned with your everyday style and you will be sure to get your fair wear out of whatever piece you chose. 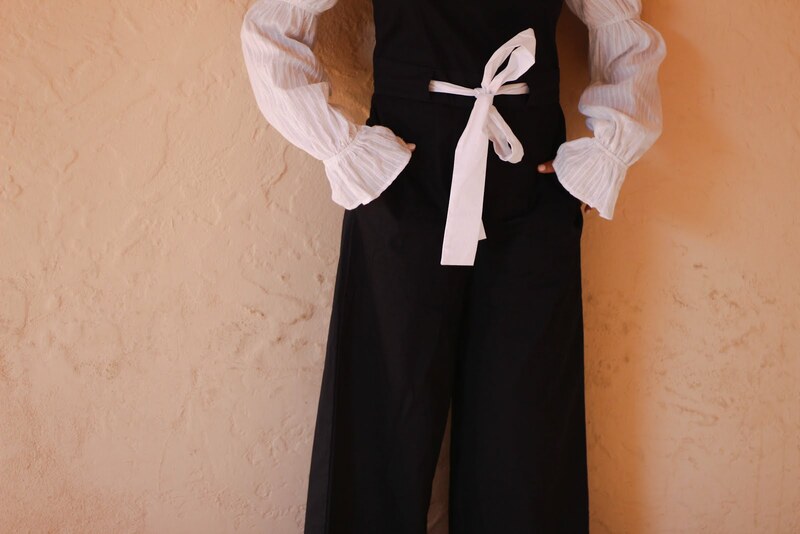 Comfort: Comfort is key in wearing anything! This coat literally feels like I am wearing a shearling blanket and I love it. The first time that I wore it to work, I seriously debated just keeping it on the whole entire day. It's just that good. What are some of your favorite outwear trends this season? Orange Balloon Sleeve Sweater: Target found here. 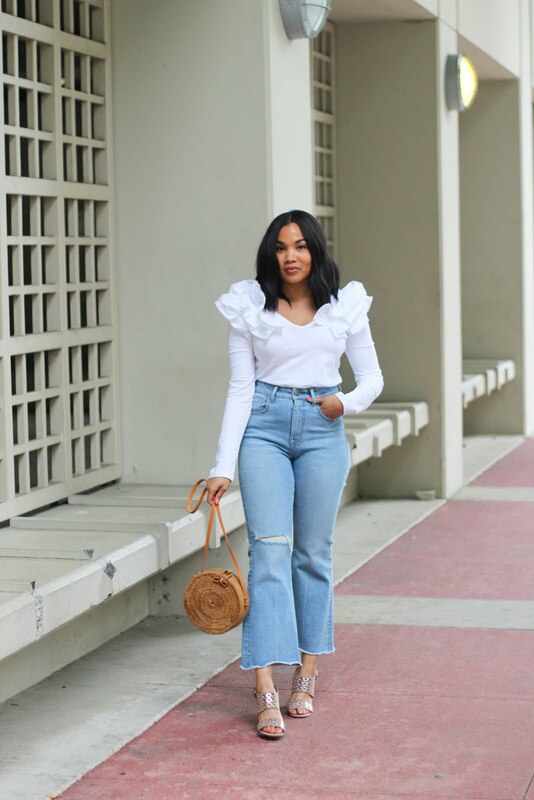 Frayed, distressed Denim: Tractr Jeans via Nordstrom Rack. Bucket Bag: Zara. Snakeskin Booties: Steve Madden found here. It's the second week into January, and I may be a little late to the game with my first post of 2018 but hey I'm here now and that's all that matters! There is nothing like a fresh start to truly put life and goals into perspective. I love that clean slate feeling about the new year. 2017 was an incredible year! I'm truly grateful for the places I was able to travel to, the people I was able to meet, and for the opportunities presented to me. One of the things that I love to do in the new year is a vision board. This just started as of last year and I feel like it really gives me focus and inspiration to go after my goals whether they be little or small. On New Years Eve, my cousin, her friend and I all sat down and made vision boards for the New Year and spoke out loud the accomplishments we were proud of in 2017, as well as what we wanted to change/achieve in 2018. Amongst my list of goals, one of my goals which really stood out to me was to be more confident and to be unapologetic. It's funny how being a blogger, you find yourself catching up with people in person and they think your life is a dream and that everything is picture perfect! Don't get me wrong, I love my life however, it is far, far from perfect. I go through high highs and low lows just like the next 29-year-old gal. In 2018 I'm vowing to love myself flaws and all- which isn't easy! It's a constant battle in the mind but the Lord knew what he was doing when he created me- every cell, every strand of hair, every piece of me was designed to serve a purpose that no one on this earth could ever compare to because there is no one like me! And, there is no one like you! There is beauty in knowing that there is no one else like you. No one else can do the things you do, the way you do them. So, OWN IT! I want to own that, and never be sorry for it. I am feeling so inspired, and ready to conquer another year. I truly believe this self-love can change things! It will easily change your perspective on life, and how you handle situations thrown your way. So, who's with me?! What are some of your 2018 goals? Would love to hear them. Leave me a comment below. One of my favorite things about seasons changing is getting to play with different color hues. 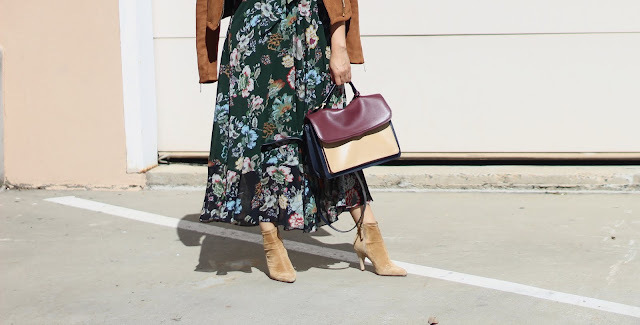 In the past, I've been naturally drawn to deep merlot shades once the temperature finally starts to cool down but this Fall is a different story. I have been loving the Marigold yellow color this season. It's saturated pigment is absolutely gorgeous and chic yet playful and fun. Also, the sleeves on this sweater are my absolute favorite. I've been seeing tons and tons of bell sleeve sweaters and they are surely going to be one of my This past weekend, we got a little bit more of a taste, well...more like a tease of chilly, Fall weather and my family and I took full advantage. 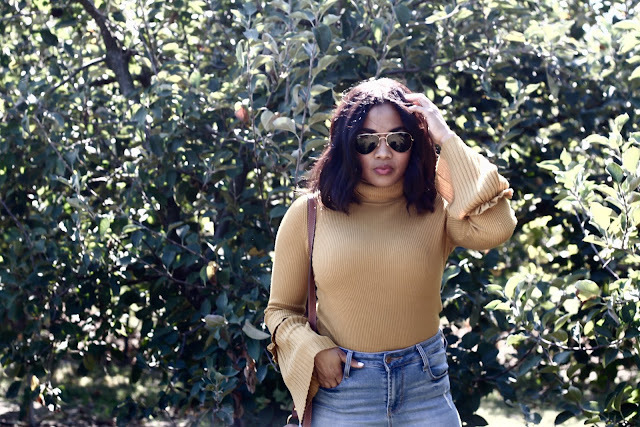 We visited Windy Hill Orchard in York, SC and partook in all things Fall i.e. Cider doughnuts, live music, hard cider flights and more! I'm so excited for the weather to actually stick around, for cozy sweaters and layers, the smell of bonfires in the crisp night, pumpkin picking and re-runs of Hocus Pocus on FreeForm LOL. What are you most looking forward to about the Fall season? Are you normally drawn to a certain color once this time of year rolls around? Let me know in the comments box below! with Fall literally right around the corner, you would think that the temps would start to cool down by now but its been the exact opposite. 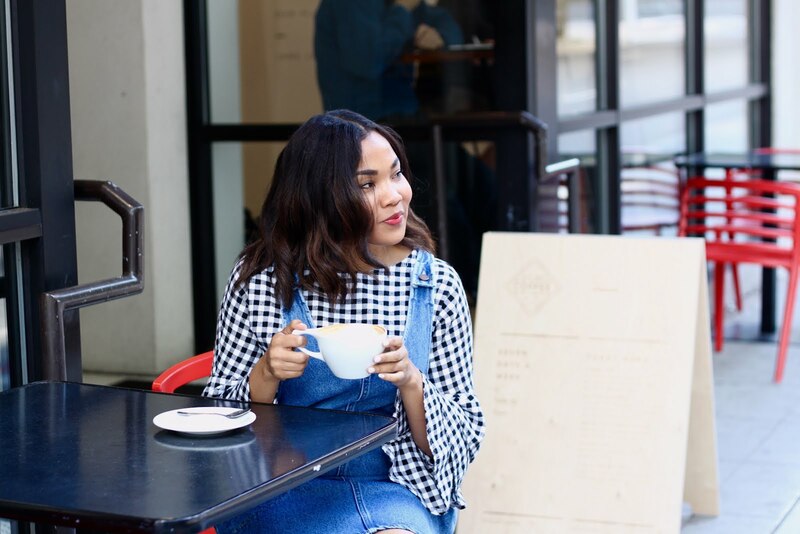 I'm anxiously awaiting the moment when the air turns crisps and stays that way so that I can pull out all the cute Fall sweaters and tweed blazers that I recently purchased and have been dying to wear! Am I the only one? 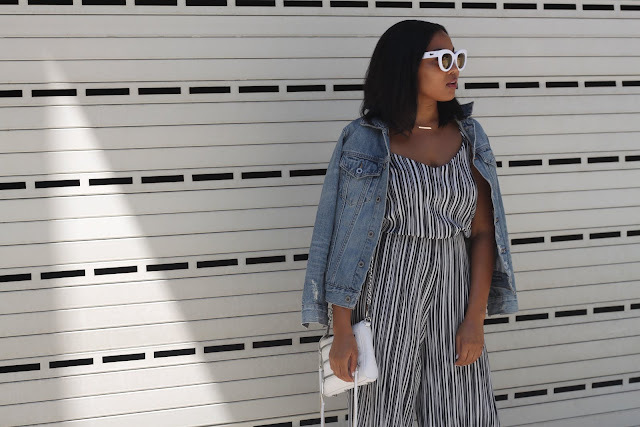 In the meantime, I've been holding onto some of my summer, closet staples like this striped jumpsuit that I recently purchased from Target. 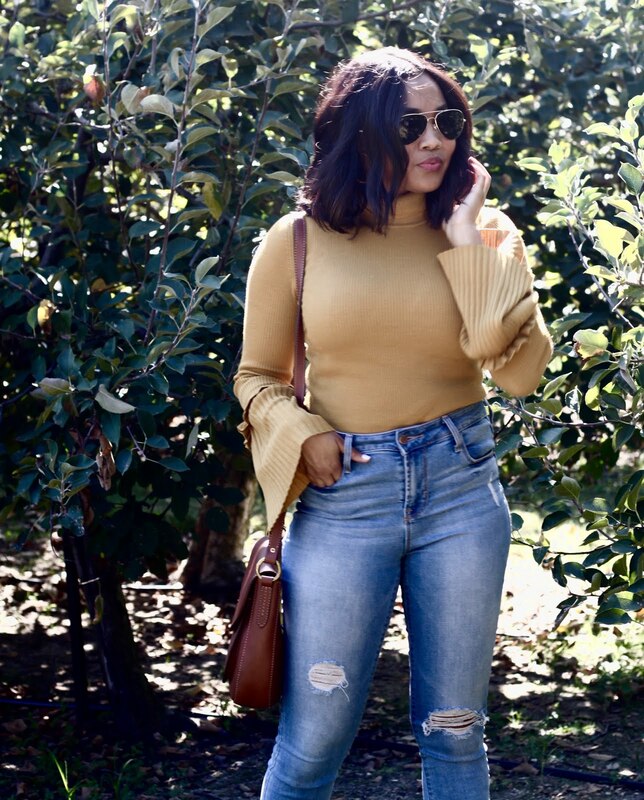 I layered it with my favorite, distressed denim jacket which is sure to make several more appearances as I start to style and shoot some Fall looks. I've been a little MIA over the past couple of months due to recently starting a new job! I plan on getting back into my regular routine and swing of things but thanks so much for following along and bearing with me! Fall has to be one of my favorite seasons, mainly because the scenery here in the Carolina's is absolutely gorgeous with the trees changing and the leaves on the ground. I cannot wait! We're ready when you are, Fall! What are you most excited for, for Fall? This week was a whirlwind- in a good way! 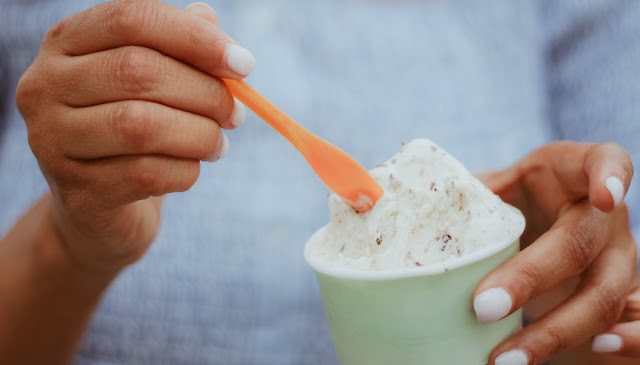 If you follow me on Instagram, or keep up with me in Instastories then you know that I was featured on Julianne Hough's website talking about 3 of my favorite places here in Charlotte, NC. My sister and I also had the opportunity to attend her Move Live Tour, and even got to meet/hang out with her after the show. I'm still in shock and disbelief about it all! 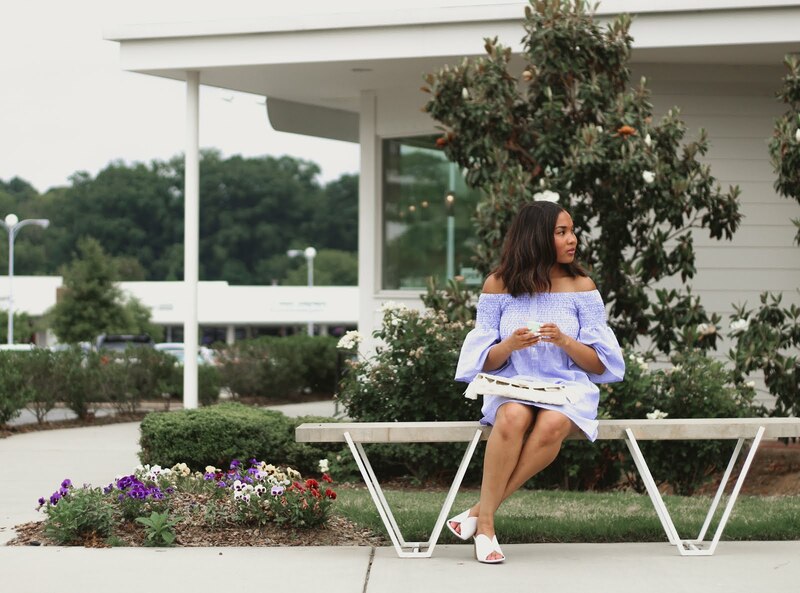 Blogging has afforded me so many amazing opportunities and open doors, and I'm so thankful and appreciative of all of the awesome ways that the Lord continues to open doors for my passion. I owe Him everything. It's also just been reassuring and encouraging to keep pushing and walking in my purpose. There are plenty of days when find myself comparing, I question my purpose, or don't really see how everything will pan out but the Lord keeps showing me that we don't always have to see the big picture. We are called to simply trust and have faith that the steps we take walking in our passion and purpose do not go unnoticed. I say all of that, just to encourage anyone reading this post. If you've been debating starting your own blog, just do it! It's overwhelming at first, but He will walk with you through it all. Giving you all that you need to complete the work that he has started within you. I wore this super cute, casual outfit for my shoot and I love everything about it. 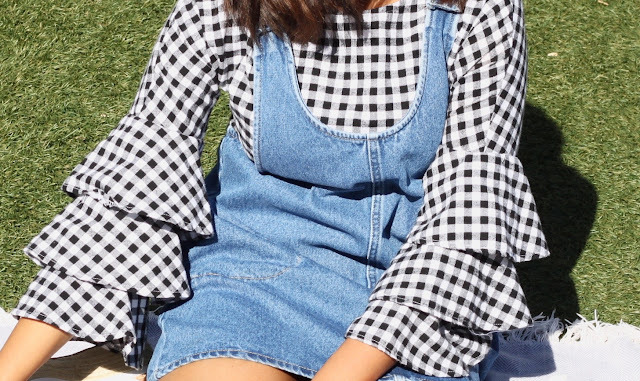 The overall jumper brings back feelings of nostalgia, and I may or may not have worn it 3 times over the first week of purchasing it. 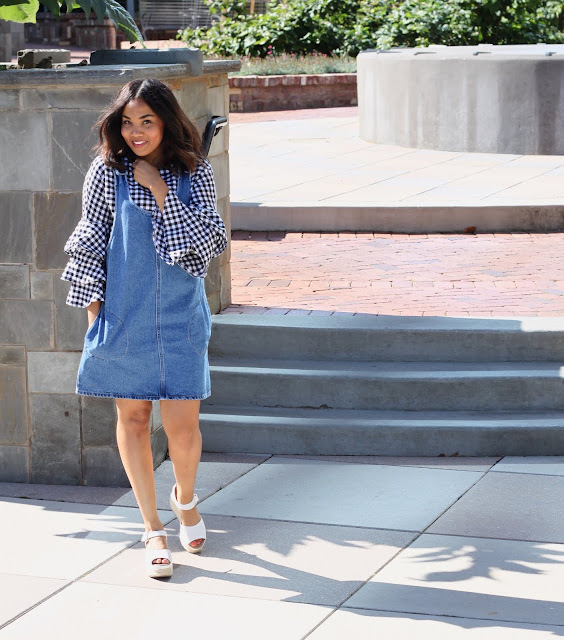 This gingham ruffle sleeve top is a SheIn find! The quality of the shirt is impeccable, and I got it for next to nothing. 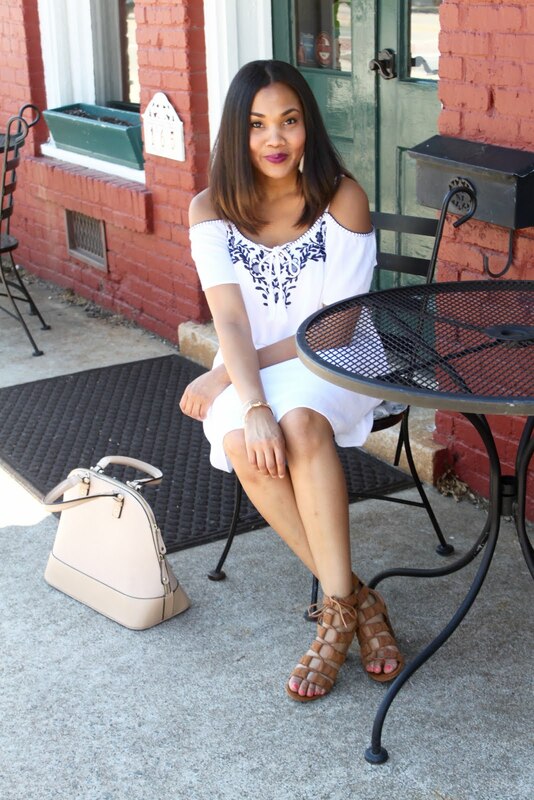 I paired the jumper and shirt with these white espadrilles that I've been raving about all Spring. 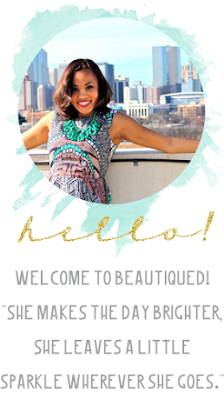 My full post of Charlotte favorites can be found here. Also, if the Move Live Tour is coming to a city near you, you have to go! The show is amazing from start to finish. Julianne and Derek Hough are SO talented, and perform with so much passion. I love how real and genuine they both are despite their fame. They have such a great appreciation and respect for all of their fans. And when I say all, I mean every.single.one. Tour dates can be found here.